The airstrike was carried out overnight to May 28 against a command post, where the IS group’s leaders were meeting to discuss the routes for the terrorists’ exit from Raqqa through the so-called southern corridor, the ministry said in a statement. "According to information, which is being verified via different channels, the meeting was also attended by the IS leader Ibrahim Abu Bakr al-Baghdadi, who was eliminated in the strike," the ministry said. Earlier, representatives of the United States’ Army had repeatedly reported about the death of the IS group’s leader, but later the report was either denied or al-Baghdadi released video messages with calls for his supporters. Russia’s Aerospace Forces killed a number of high-ranking commanders of the Islamic State terrorist group, including 330 field commanders and militants, in the southern suburb of Syria’s Raqqa in late May, the Defense Ministry said. "The strike, carried out by Su-35 and Su-34 jets, destroyed high-ranking commanders of the terrorist group, who were part of the so-called military council of the IS, and also some 30 middle ranking field commanders and up to 300 militants who were their bodyguards," the ministry said. Among them, according to the ministry, was Raqqa Emir Abu al-Hadji al-Mysri, Emir Ibrahim al-Naef al-Hadj, who controlled an area between Raqqa and Es-Suhne, and IS security chief Suleiman al-Shauah. The ministry said Russia had warned the United States about the strike on Raqqa’s southern suburb. 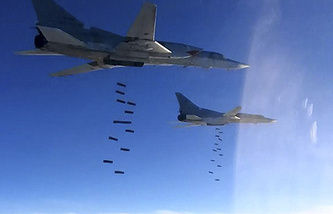 "The American side was notified in advance through interaction channels about the time and place of the Russian airstrike," the Russian Defense Ministry emphasized.